James Joyce’s Ulysses was a major literary event well before its publication. Seven years in the writing, the novel was recognized for its beauty and originality when it began appearing in serial form in a U.S. literary magazine, only to be confiscated when a court found it unprintably obscene. But because Joyce was stubborn and his patrons generous, Ulysses found its way into print in Paris in 1922, the wonder year of international modernism. Since then, it has inspired dozens of adaptations, prompted many hundreds of scholarly studies, and launched thousands of literary pilgrimages to Dublin, where readers retrace the steps of Joyce’s characters in their latter-day reenactment of Homer’s Odyssey. “Joyce’s Ulysses: Making Readings” is the first in a new range of English Department courses called Critical-Creative Approaches. We’ll devote the first ten weeks of the semester to reading Joyce’s novel alongside selected criticism and adaptations in a variety of media. Classroom discussion, mini-lectures, and student glosses will form the basis of this part of the course. We’ll spend the final month of the course collaboratively making readings of Ulysses—conceiving and producing hybrid creative-critical projects that engage with the novel in some way other than conventional analysis. You might co-write an apocryphal episode, complete with schema and annotations. You might produce a film or stage adaptation of an episode that benefits from your readings in Joyce criticism. Or you might devise some other approach entirely. 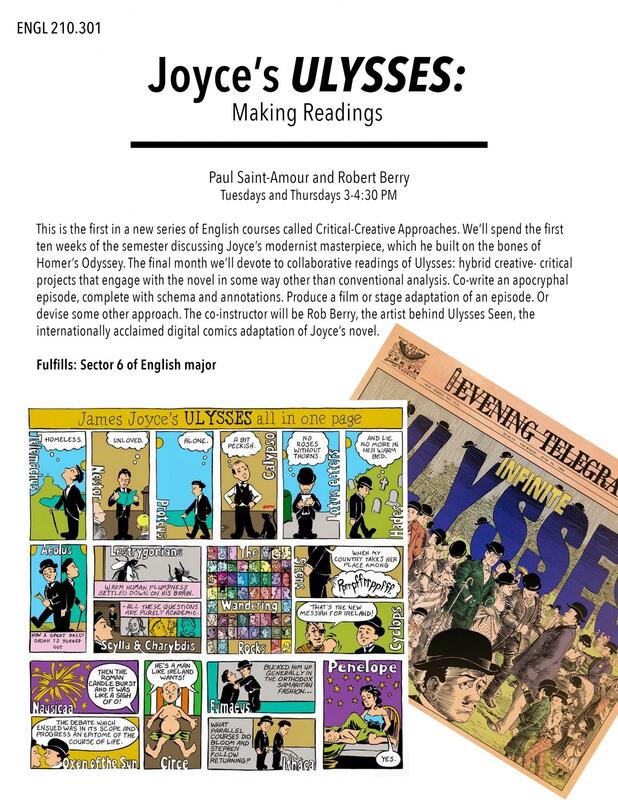 Our co-instructor and primary consultant on the final projects will be Rob Berry, the artist behind Ulysses Seen, the internationally acclaimed digital comics adaptation of Joyce’s novel.